You are at:Home»Relationships»10 Signs Your “Bae” is a Cheater. If he’s doing any of these, he’s got a side piece. 10 Signs Your “Bae” is a Cheater. If he’s doing any of these, he’s got a side piece. Whether you’re in a new a relationship or just dating, there are a few hidden signals you should be aware of! Is Mr. Right too good to be true? Is he attentive? Does he give you enough affection? Does he enjoy spending lots of quality time together? If you’ve answered yes to all of these, keep reading along, you’ve fallen victim and need to know all the signs. There are a few faulty qualities every woman should know about her loving bae! It is important to know the difference between a caring boyfriend, and a boyfriend who is a controlling cheater. Being able to distinguish the two is very important, no woman wants to end up with a passive aggressive jerk. Constantly telling you, “You’re Perfect”. Sound familiar? Yes? That’s strike one! Two more and he’s out. You’re my dream girl, there’s no one better than you and wait, how about this one… you’re too good to be true— Please excuse me while I hypothetically dry heave. What he’s doing here is gasing you up, he’s filling your mind up with non-sense. If he reminds you every single day about how perfect you are, there’s something going on, you need to look a little further into it. Either he’s putting you on too high of a pedestal or it’s his guilty conscious speaking. Don’t get me wrong, being told that you’re perfect is awesome for your ego, but if he’s frequently reminding you, there’s something going on and you need to figure it out. Do you think your man has someone on the side? Possibly a side piece? He’s most likely trying to keep you wrapped around his finger. Gaining access to his texts and calls can be the perfect solution in determining his true intentions. The faster you can figure it out, the faster you’ll be able to ghost him. He jokingly calls you “crazy”—ummm…let’s reevaluate… he’s the crazy one. If he always calls you his crazy girl, eventually you’ll begin to question it. “Am I really crazy?” Most likely not, but when you begin to question it—BOOM! He’s got you right where he wants you! When you begin comparing yourself to him, you’re then putting him on a pedestal. You should quickly realize and push him right off. Put yourself right back on it, because that’s where you deserve to be. Texts you every moment while you’re out with the girls. I can see how many women would think that it’s sweet, however it’s not. Wake up and read between the lines! That’s his way of monitoring your every move. God forbid there’s a gap in the conversation, what was more important than him at that moment? Perfect excuse for an argument and perfect excuse to ruin your night out. After all is said and done, you’re left feeling bad and like an awful girlfriend. Just a small reminder: if this is happening to you run for the hills! You’re entitled to have a night to yourself. Time apart is healthy for a relationship. If you’re out having a good time and he texts or calls to check in, that’s totally fine. But, to keep tabs of your every move is pretty creepy and should count as another strike out! Backhanded compliments, like when you’re dressed and ready to go out with the girls and he makes remarks like; “Don’t you look nice, you’re definitely going to attract men with that outfit.” If this happens, it should count as a first, second and third strike! A calculating and manipulating person frequently makes these kinds of remarks. He’s extremely jealous, and lashes out. This is a telltale sign he is cheating on you and his insecurities are getting the best of him. 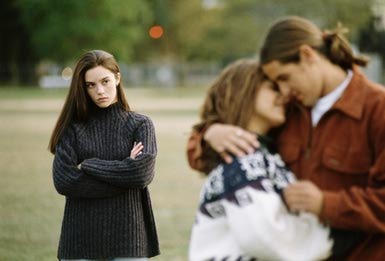 Jealousy is very toxic and definitely leads to the down fall of a relationship. If you’re considering a monitoring app, don’t worry you’re not alone. Many women today choose to gain insight for themselves by accessing his cell phone. They can easily get the answers they need and choose to move on or not. Whatever the case may be it is very important to have the answers you need. You can always use a reverse cell phone lookup if you think someone else is texting your man. Comparing you to other women, whether it’s to tell you that you’re better looking than another woman—it should NEVER happen. This is a huge sign of his insecurities, and a man with insecurities is a no, no. If it’s not already happening, it can lead to unfaithfulness. I can completely understand why a lot of women fall for these “sweet” gestures, however it is my duty to inform you about his passive aggressive ways of keeping you locked into something toxic. It is up to you to finally get proof of his cheating and if by any chance he isn’t, then you know for sure that you’re not being played a fool. Maybe it’s time for a new boo… but, only you can make that decision.